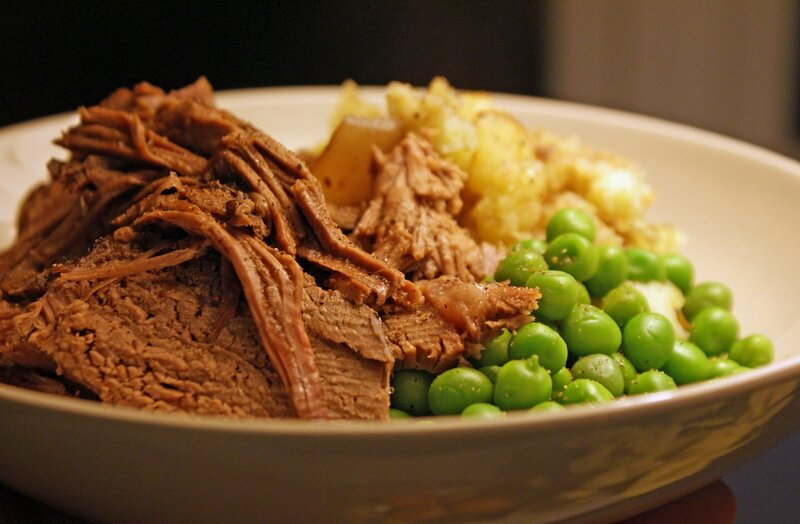 There are two ways to cook a pot roast: on the stovetop or in the oven, and the choice of liquid and flavorings you use are largely up to you. Any kind of broth, wine, tomato juice, and water all work well, and I have even heard of people using coffee. 1Season your roast with salt and pepper. In a large pot or Dutch oven set over medium-high heat, heat the oil until hot but not smoking. Brown the roast on all sides, turning it with tongs or a fork. This caramelizes the outside of the meat, adding flavor. 2Remove the roast from the pot and set it aside on a plate. Add the onion, carrot, and garlic to the pot and cook for a few minutes, until they start to brown. (If you want to skip this step, just throw the veggies in with the roast. Cooking them first caramelizes them a bit, adding more flavor.) Return the roast to the pot and add the liquid and any seasonings you like. 3Cover the pot tightly and simmer the roast on low heat on the stovetop or inside a 275°F oven for 2-4 hours (depending on the size and thickness of your roast). Or pop the lot into a slow cooker and set it on low for 6-8 hours. 4Remove the roast from the juices and set it aside. Tent it with foil to keep it warm. Let the juices settle for a few minutes, then scoop any excess fat off the surface with a wide spoon. Strain the solids out by pouring the juices through a sieve or using a slotted spoon, or purée them with a hand-held immersion blender (or in a regular blender or food processor). Return the strained or puréed liquid to the pot, set it over medium heat and bring it to a boil. Simmer for about 10 minutes to reduce and concentrate the juices, adding salt and pepper to taste. If you like, stir in a few spoonfuls of sour cream for a creamy gravy. 5Slice or shred the beef and serve it with the sauce poured overtop, preferably with mashed potatoes to catch the drips.